A few people have been in touch with me recently asking me how I've grown on Instagram and how I've found "my flow". Whilst I am by no means an expert, I thought I'd share a few tips I've learnt along the way. When I first started out I was always reading up on Instagram, trying to find the magic secret. The truth is there isn't a magic secret, Instagram changes all the time and there are definitely peaks and troughs. It also takes work and time. I wouldn't recommend doing anything unless you actually enjoy it. For me, it's a hobby where I can express my passions for Interior styling which I live and breathe. Most of what I learnt in the beginning came from Sara Tasker of 'Me & Orla' fame. I'm sure you've heard of Sara already but if you haven't go check her out. 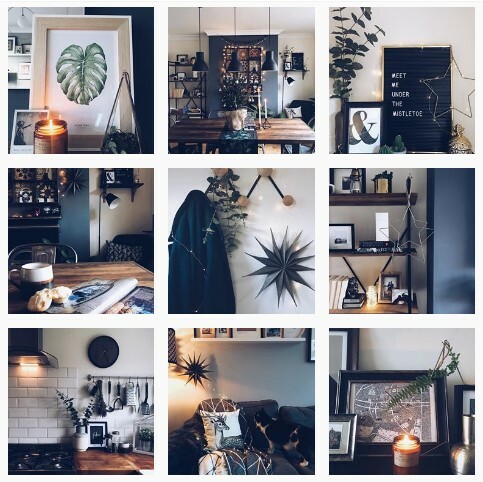 She has a beautiful Instagram account and an amazing blog where she shares all her tips and tricks of the trade. She even does Instagram courses for the more dedicated lot amongst us. I did a styling workshop with her in 2016 and one of the things that stuck with me was the use of the app Mosaico. This has been a God send for me when it comes to planning my posts. Working the 9-5 as many of us do, especially in winter, makes it impossible to take daylight snaps as it's dark when we leave and dark when we come home - is it Summer yet?!? I'm also not a very impulsive person - I like to plan, and plus my house is not clean all the time! It's probably only clean for about 3 days of the week! Mosaico allows you to see what each image looks like on the grid and everything works together and flows. It also lets you save regularly used hashtags so you don't have to type them all in constantly. Speaking of hashtags, I think they are still really relevant. In my opinion they are the best way for audiences to discover you. A great account I follow for Interior tags is Eclectic Street. Every week the lovely Sam rounds up the best hashtags in the Instagram world and posts them for people to use and share. It's really good for discovering new tags and accounts and some of them even involve prizes. If interiors isn't your thing, look at accounts you really admire. See what hashtags they are using, search those hashtags and see what other people are posting under it. This is great to collect inspiration and discover other awesome accounts. My saved collections from all the amazing inspirational accounts I follow. Another really important tip I learned is to post regularly and consistently. I post pretty much everyday at the same time - it's usually on my way into work on the train where I get ten minutes to chill before the madness of the day starts. It doesn't matter if you can't commit to everyday - all the experts say just being consistent is key. So if you can post once a week, every other day, whatever you can then do it, and stick to it. Obviously on weekends I'm not setting an alarm for 8am but I still post in the morning, a couple of hours difference won't hurt so don't stress about it. My morning commute - on a good day! The rumours are true - it rains more than it shines here in Manchester. Remember Instagram is a community and what you put in, you get back. Regularly interacting with people's accounts that you like and follow, whether that be commenting or liking or direct messaging and just generally having a chat - it pays off. You will appear on peoples radar and they are more likely to follow back and interact with you if they like what they see. If you become stuck with what to post and run out of inspiration, don't worry you are in the right place. As well as following really inspirational accounts, there are plenty of people doing photo prompts. These prompts get the creative juices flowing and give you great content without even realising it. The 'My House This Month' is one I like to join in with when I can. I even wrote a blog post about my first attempt which you can read here. There are currently over 80,000 posts on there so you can imagine all the amazing accounts you will discover and all the possible people who can discover you by searching that particular hashtag. My last tip is to use an editing app to take your photos from good to great. I personally use VSCO which has beautiful filters that are free and also really nice ones you can buy for a couple of pound. It also allows you to edit things like brightness/contrast, straighten those wonky angles and play with shadows and highlights. I tend to use the same one or two filters to create consistency with my images. See below for a before and after! After! Using VSCO filter and editing features. So that's it - like I said at the beginning I am no expert and I've pretty much self taught myself for about a year. It's trial and error but a lot of fun! I hope you found it useful, please feel free to message me with any questions and go check out those accounts I mentioned, you won't regret it!